Oh the dull drudgery of bottling! What better catalyst for throwing oneself into the world of beer kegging could there ever be. With kegging those seemingly endless hours spent cleaning, removing labels and sanitizing countless numbers of bottles becomes a thing of the past. A single five gallon keg holds the equivalent of four dozen 12 ounce bottles and a keg is much easier to clean, sanitize and fill than all of those bottles. Kegging also saves a lot of time and that time saved will be much better spent enjoying delicious draft beer at home. Using little more than a bottle of Co2 and regulator, a short length of beer line and a picnic tap you will be able to pour yourself a draft beer almost anywhere. 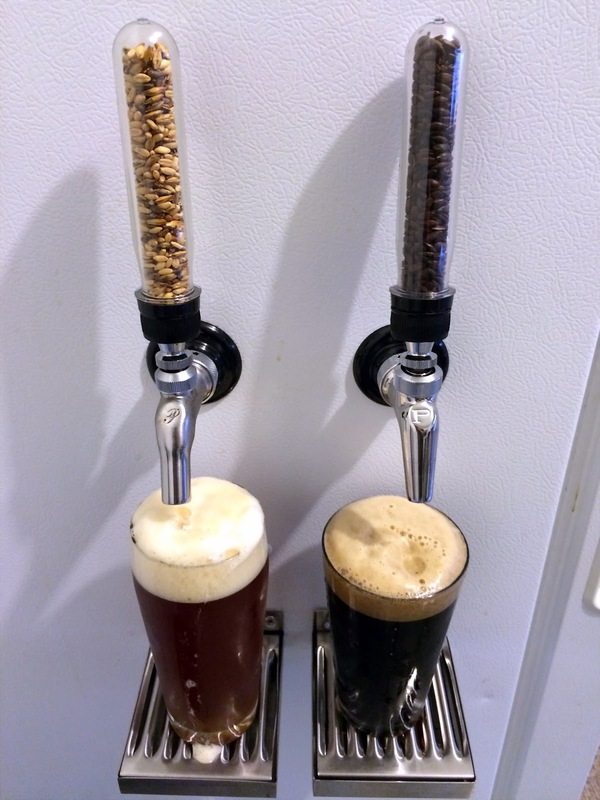 In time you may want to expand your basic kegging system to include a high quality beer faucet and tap. One easy way to install a beer faucet is to locate it on the side of a refrigerator. But before drilling any holes be sure to check to make sure that there are no wires or refrigeration lines in the way of the drill bit. I spoke with the General Electric customer support folks and they confirmed that the sides of my Americana model A3316ABSHRWW refrigerator did not contain any hidden wires or tubing. If the side walls of the refrigerator are free of obstructions then installing the beer faucet in the side is your best option. Although door mounted beer faucets are another option the beer lines will need room to move around inside the refrigerator whenever the door is opened and closed. 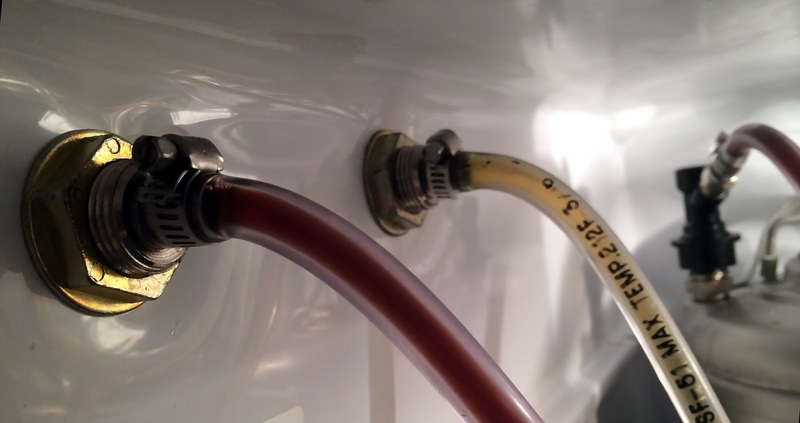 Some homebrewers hold off on kegging until they are no longer devoting all of their free time to brewing beer. If you have never installed a beer faucet before the process may seem overwhelming to you at first. But it is reassuring to know that installing a beer faucet is easy to do once you know how. Once your new beer faucet is installed you will be able to drink fresh draft beer anytime you want without ever having to leave your home. Before getting started there are a few things you will need. An electric drill with a 7/8 inch hole saw is used to drill the hole through the side wall for the nip shank. A pair of channel lock pliers or a wrench is needed to tighten the flange nut onto the shank end inside the refrigerator. A small screwdriver is needed to tighten the hose clamps that secure the beer line to the barb end connectors. 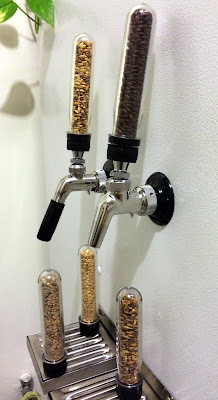 The main parts used in a beer faucet installation are the beer faucet, a nip shank, a tap handle and a drip tray. Beer faucets can be ordered in several styles and types, I prefer using stainless steel over the chrome or plastic types. Stainless steel faucets are durable and they will never pit, rust or corrode under normal use. The Perlick taps are made using a patented design that uses less internal parts than other beer faucets. This design greatly reduces the chance of any mold, mildew or bacteria from growing inside the faucet and tap. Combined with the benefits of all stainless steel construction the Perlick beer faucets do provide you with years of trouble free use. It can easily take a day or more to hunt down all of the parts needed for a brewing project. Knowing in advance which parts to order and having the correct parts on hand before starting the installation will actually save you a lot of time. I decided to install a Perlick Forward Sealing Faucet (304 Stainless) model to use in my installation. I had previously installed the stainless steel Perlick Creamer Faucet and wanted the new faucet to match the same look. Mark the location and then drill a small diameter hole in the side of the refrigerator where you want to install the faucet. 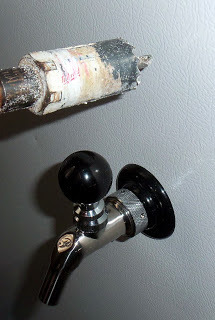 Run the drill bit through both the outer and the inside refrigerator walls. Next use a hole saw to drill through the outer metal wall of the refrigerator, using a medium drill speed while pushing lightly on the drill. Remove the metal circle cutout from the hole and then drill through the foam insulation until the tip of the hole saw pilot bit comes through the inner wall of the refrigerator. Take care not to use too much force when drilling through the plastic inside wall of the refrigerator. The goal is to drill a clean hole through the inside wall without creating any cracks in the plastic. A small vacuum cleaner does a good job of cleaning up any foam particles created during the drilling process. Once the hole has been cleared of foam remove the flange nut from the barbed end of the nip shank. 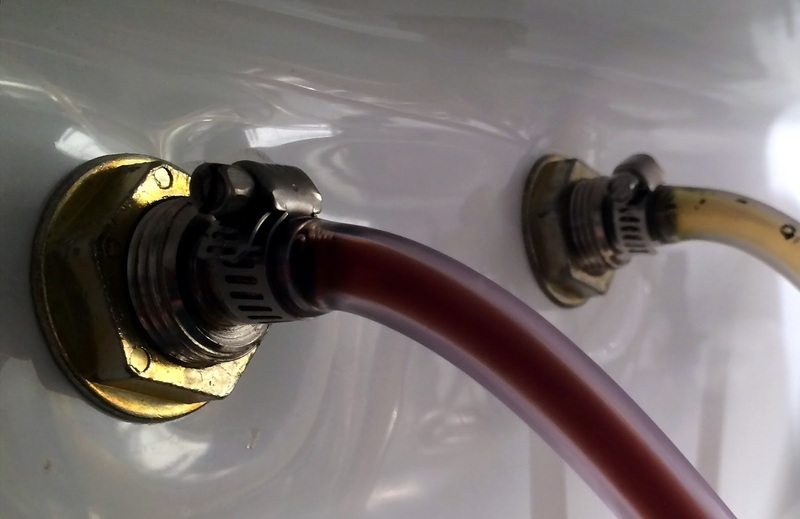 Next align the beer faucet with the collar end of the nip shank and then firmly tighten the collar to connect the faucet. 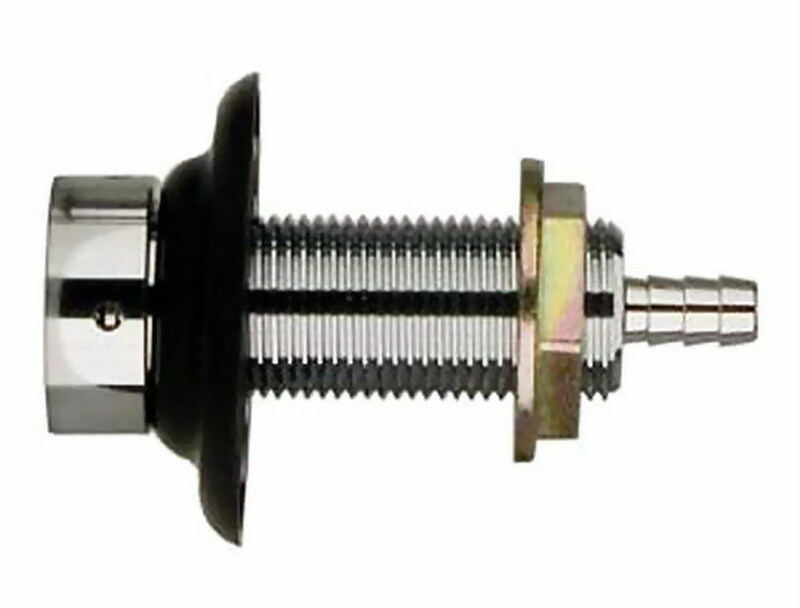 Push the barb end of the shank through the hole and secure the assembly in place by holding the faucet level while tightening the flange nut. With the beer faucet connected to the nip shank and the assembly firmly secured to the refrigerator wall connect a 10 foot long length of 3/16 inch inside diameter beer line to the 1/4 barb end of the nip shank. Using this combination of beer line diameter and line length allows me to carbonate and serve my kegged beer with the Co2 regulator set between 10 to 12 psi. Soaking the 3/16 inch beer line end, in near boiling water for a minute, will soften it enough to slip onto the larger 1/4 inch diameter barb. With the beer line firmly over the barbed end of the nip shank secure it in place using a small stainless steel hose clamp. To connect the beer faucet to a keg you must first attach the barb end of a 1/4 inch swivel nut to the end of the beer line and secure it with a small stainless steel hose clamp. With the beer line attached to the nip shank and the swivel nut and both hose clamps tightened, the swivel nut can be tightened onto a beer out post connector. Snap the beer out post connector onto a keg of carbonated beer and then pour a cold one to enjoy as you check and make sure there are no leaks. The drip tray is mounted to the side of the refrigerator using two short stainless steel sheet metal screws. Before drilling the holes make sure that your tallest beer glass will fit between the top of the tray and the bottom of the beer faucet. Then center the beer tray underneath the beer faucet, while holding the tray level, then mark the tops of the slotted mounting holes on the wall using a pencil. Locate the pencil marks and then use a 1/8 inch drill bit to drill through just the metal outer wall of the refrigerator. Loosely thread the screws into the side of the refrigerator and then slip the drip tray mounting slots over the screw heads. With the drip tray hanging from the two screws tighten the screws, leaving a 1/8 inch space between the wall and the screw head. When it comes time to clean the drip tray you should be able to lift it off the mounting screws without having to use a screw driver. In less time than it took to write this article I was able to install a second Perlick beer faucet in my refrigerator and by following these instructions so can you. Enjoying some of your blog post. Nice work! 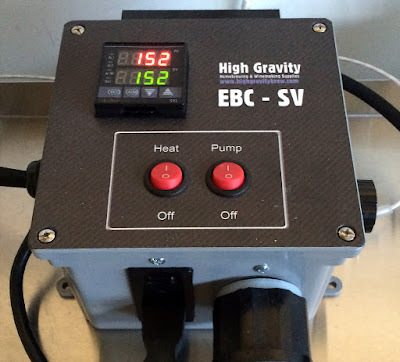 Hi Vince, enjoyed reading about your electric brew day, I have the same system. Question, how did they make those custom beer taps with grain inside? That is great! FWIW, I did not clean the previous build up off the element and the system kept popping a breaker in mid-brew day. Sent it back to Dave Knox and as you point out, he was great. Told me the problem and shipped it back brand new. Lesson learned. Hi Dale, Cleaning the system, heating element too, at the end of each brewday is very important to keep things in good working order for the next brewday. Pumping a few gallons of 140F water, mixed with Oxi-Clean FREE, will easily remove any residue. Use a small bristle brush to clean in between the heating element parts too. After a thorough cleaning, pumping 140F clear water through the system will keep your eBIAB system working like new for a very long time. As for the tap handles just drill a 7/16 inch hole through the center of the cap and Gorilla Glue a 3/8 inch hex nut to the inside of the cap. 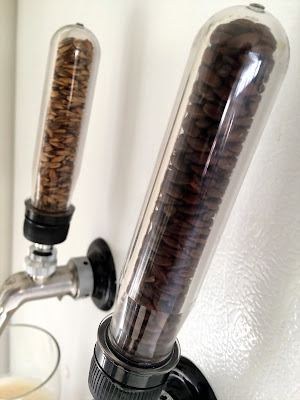 After the glue sets fill the vial with your favorite grains, screw on the cap and thread it onto your beer faucet.